The pinball representation has just about gone through the roof. The main room from last year easily spilled over into the secondary room this year. I should have counted the pinball machines there. There were so many. Most of my favorites were there - Tales of Arabian Nights, The Twilight Zone, The Adams Family, Star Trek The Next Generation, and Attack from Mars. Laura and I played Joust, and she beat me - badly - three or four times. I think she kept getting all of the multipliers or something. Our last game's score was something like 2,100,000 to 438,000. I have absolutely no idea how she schooled me like that. Quite embarrassing. There were certainly plenty of arcade games. We played some Centipede, Ms. Pac-Man, Asteroids, Tapper, Tempest, and Robotron among many others. I found myself getting addicted to Gravitar. I honestly think that I only first played the game last year maybe once or twice. This year found me hooked. I am pretty sure my Gravitar days are far from over. I managed to get on the top 8 "Killer Pilot List," but my score was a measly 6200. I improved upon it a bit later, but honestly needed more time on the machine. I was hesitant to spend too much time because other people wanted to play & there were other machines there as well. I am not really that great at Robotron. As a matter of fact, I am just not a Williams games guy. That said, I scored 102,275 and placed 6th on the Heroes list. That made for 28th all time on that particular machine. Maybe I need to practice a bit and try to get a decent score next year. That score might be respectable, but it certainly isn't good. Plenty of room this year. They could easily expand more next year if more machines show up. Late 70s and early 80s were well-represented. I have to admit that I personally wouldn't mind seeing some mid 80s and possibly even late 80s games. There are some obvious classics in the early 80s. I logged some time with Missile Command here and there. Donkey Kong and Donkey Kong Jr. were there...The only real mid-eighties representation was that of Dragon's Lair and Space Ace. Those games (mostly Dragon's Lair) have a cult following, but I have to admit that I rarely see people play them be it 1985 or 2009. I have always been surprised to hear some people talk about how big Dragon's Lair was. As for me - I wouldn't mind some Sega 16 games like Shinobi or some multiplayer co-op games like Xybots. What about some driving games like Hard Drivin' or Roadblasters? How about Operation Wolf/Thunderbolt? I played Terminator 2 last year, but it was missing this year. Still - It was fun to have the games we played. Keeping it early 80s works. I only wish we had a few more machines that ventured into later years. Last year, Atari Age added console games to one corner of the expo. Last year's representation was better than this years, but this years was still fun. This year included a few Atari 2600s, one 5200, one 7800, and a Colecovision. Last year had those as well as a Fairchild Channel F, Atari XEGS, Intellivision, and even a rogue Philips CDI at one point. I didn't have as much fun with the consoles this year. Last year, they generated a lot more discussion among people. I remember talking games with several of the guys there. It was a load of fun. We would bring up games, mention some diamonds in the rough, and then scramble to fire them up on the console. It was awesome! You take a room full of people, someone mentions a game, others haven't heard of it, and then you have a heard of adults moving over to a machine so the one telling the story can show off the game. This year brought about a different type of fun. I met Al of Atari Age - he is the guy that co-founded Atari Age and brought the consoles to the expo. I also met Darrell Spice, Jr. 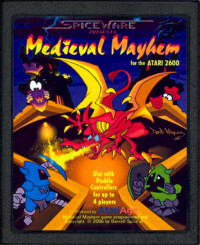 He is big in the Atari 2600 homebrew scene and actually wrote several of the games I played while I was there this year. I have to brag about Medieval Mayhem. It is a jaw-dropping Atari 2600 rendition of Warlords. Those of you that have played Warlords for the Atari 2600 have probably said, "eh. It's the 2600" and shrugged it off, insulted the port, or said, "they could have done better." Darrell said they could have done better, and he MADE IT BETTER. One programmer sent in the dragon, and several people managed to put together an INCREDIBLE Warlords port for the 2600. I am planning on picking it up. It may inspire me to work on the Atari 2600 homebrew scene. Goodness knows what game I would try to write/port, though. I am definitely going again next year. I hope that the rest of you have a chance to get out and do something like this in your local areas. I can understand playing old console games on emulators from time to time, but you can't beat an arcade full of people, music, machines, pinball, and atmosphere. I'd say that it is easily one of the best "historical environments" that a group of individuals can recreate. Well...minus the fashion trends, I suppose. Wow - thanks for making this report mate! Love the last photo with the pinball playing trooper! I'm with Mark--thanks a ton for this coverage! Whoa. I wonder if they have anything like this in Minneapolis or the surrounding area? The best programmers of the past are on par with the best homebrew programmers of today and vice-versa, which is a compliment to both. Each had their own challenges. The programmers of the past did it as part of their full-time job and were financially compensated in some manner, while today's homebrewers do it in their spare time and have little compensation to show for it (probably worse than writing books for us). All of the other factors you say are true as well - today's homebrewers have many of the past experiences to draw upon, better and quicker dev tools, etc. However, the biggest distinguishing factor to my mind tends to be cartridge capacities. While 2K - 8K was the norm back in the day, up to 64K is not unheard of today. That's a big difference and a big benefit to the modern hombebrewer versus what original programmers were dealing with. Of course, having 30+ years of knowledge to drawn upon is probably right up there as well. One of the greatest developments on the Atari 2600 homebrew scene - which is inarguably the best homebrew scene on the planet - was the development of Batari Basic, which opens the 2600's imposing architecture to those of us without engineering degrees. While it can't realistically generate something the level of a Medieval Mayhem, it DOES generate commercial quality games. Exciting stuff, as is most everything it seems targeted to the platform, be it hardware or software. It's the perfect combination of nostalgia and just good enough hardware with accessible controls, etc. That was awesome, Chris! And no, there isn't, and probably never will be, anything like this in my area. The closest thing I saw here was a "Star Trek expo," which seemed more like an exclusive "user group" where I felt like I didn't belong. I think Matt is onto something, though. The Atari homebrew scene does have significant advantages over the programmers of the old days in the form of dev tools, community, information, and technology. What they DON'T have, though, is significant financial incentive or competition, nor will they get significant recognition from a historical perspective. It is the sheer love of the act of programming a game that they do it! And that's great, but in a way, it's also a bit sad that these talented programmers of today will never get the recognition they richly deserve outside of the homebrew community. thanks again Chris for the write up! check out this year's show! $20.00 a day $30 for a weekend Pass, Kids 4 and under are free!